The article below was up at American Thinker yesterday. I’ve got another one on the Assembly of State Legislatures meeting in June that I’ll be submitting in a couple days. The Trump Brigade at AT are frothing at the mouth in the comments section, as usual. These guys don’t use language that well, so they resort to the use of capitalization for emphasis. They’re like people who can’t communicate in a foreign language who raise their voices trying to make themselves understood. Some of them are a little unhinged. Someone made the point, which I agree with, that all the wind came out of the Cruz campaign around May 1st, when Trump was harassed by protesters at the Republican State Convention. That pushed Trump over the top in California, and all was lost. Dr. Evil, George Soros, strikes again. He funds these groups, and they have the effect he’s paying for. Rep. Ken Ivory of the American Lands Council tells me he’s being stalked by them. It was a Soros funded group that killed the BBA in Montana. Well, at least we’ve got Rupert Murdoch on our side. Oh, wait. If Fox is a conservative network, why do they boycott any news about Article V? I used to watch Special Report almost very day, and nary a word. I’m starting to think it’s deliberate. On a brighter note, I just joined seven million other Americans in cancelling my ESPN feed on Directv. Altogether my new package is $33 less a month. The firing of Curt Schilling pushed me over the edge. Everyone who’s boycotting Target, and yet subscribes to ESPN, is missing the boat. Every ESPN cancellation is a blow against the thought Nazis. For once the Queen of the Hive, the NYT, is following, rather than leading in political coverage. When Bob Woodward announced that Jeff Bezos and his WaPo had declared war on Trump, the Queen was forced to follow suit. It’s still too early, as far as the Queen is concerned, but she can’t be left behind. The juiciest stuff was supposed to be withheld until after Cleveland, when Trump will be formally nominated. Starting in on him too soon runs the risk of exposing him as unelectable to the delegates, perhaps sparking a revolt. But the WaPo isn’t waiting, so neither can the Queen. She’s out with a piece describing Trump’s boorish private behavior with women. Drip, drip, drip. They’ll keep this up for six months. There’s so much to work with. New York politics is corrupt through and through. It’s probably why Andrew Cuomo never ran for President. Anyone in it gets dirty. Trump enjoys wrestling with pigs, and he’s up to his ears in corruption. The Reagan coalition is dead. A new one is needed. We’ve got four years to figure it out. In 1979, as Reagan launched his second campaign for the White House, Communism was still on the move. After receiving a kiss on the ear from Leonid Brezhnev, President Jimmy Carter believed our fear of Communism was inordinate. Then came the invasion of Afghanistan, and he changed his tune. 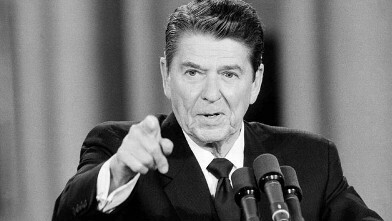 But if you wanted to stand up to the Soviet Union, it was clear you for Reagan. Big Labor, under George Meany, was fiercely anticommunist, as was the Catholic Church. Anticommunism was the glue that held the Reagan coalition together. In defeating the Soviets, Reagan broke up his own coalition. In 1980 Roe v. Wade was seven years old, and the religious right was in ascendancy. Social conservatives were the second leg of the Reagan stool. But this bloc of votes is dispirited, and has disintegrated. Republicans have not only failed to reverse Roe v. Wade, they’ve been losing the culture wars on all fronts, from gay marriage to transgender rights. When Cruz lost the evangelicals of the South, his path to victory became narrow and treacherous. These voters, more than any other, gave Trump his eventual victory. They care a lot more about Trump’s issues than the ones their Preacher is always talking about. So we’re left with constitutional conservatives and libertarians. But we don’t control the Republican Party. The Chamber of Commerce controls the Republican Party. These people are in it to line their pockets. The first step to putting a New Conservative Coalition together is to take control of the Convention in Cleveland. By doing so, we will write the Rules for the 2020 primary, and write them in our favor. We also preserve our conservative Platform, and improve it. Not only will we remain pro-life, we’ll also become pro- Article V, and pro-transfer of federal lands to the States. Come 2020, these could both be powerful issues. If Article V continues to make progress, as it will, the realization that the States, and the people, have a way to get control of the federal government will help us put our new coalition together. And the transfer of federal lands gives us the bedrock of our new coalition — the Far West. We need a candidate with the courage to stand up for the bedrock principle of the Constitution — equality before the law. In fact, in America today, we are not equal before the law. Some minorities are given privileges not available to their fellow citizens. It’s wrong, and everybody knows it’s wrong, and counter productive, and destructive of harmonious racial relations. But no one will campaign against it, because they’re afraid of being called a racist. Donald Trump is an unabashed supporter of affirmative action. If Ted Cruz had gone into the Southern primaries campaigning against him on this issue, he could have won the nomination. People are very much against affirmative action in the South. But he was afraid of being called a racist, so he kept quiet. As did every other Republican running, for the same reason. None of them had the guts to stand up for equality before the law. If a political party and its candidate refuse to stand for that, I don’t want any part of them. The most important accomplishment of my political career was defeating an effort to create an exception to the principle of equality before the law in the Alaska Constitution. I was called a racist, and anti Native. But if fear of being libeled as a racist paralyzes you, you’re not a leader. The new coalition must be an anti-government coalition. If you want to fight the federal government, and Congress, and the political class, then you’re with us. Environmental extremism, over regulation, crony capitalism, and the IRS have combined to create the conditions needed for a revolt against the Washington cartel. But being anti-government doesn’t mean being necessarily libertarian. We’re just against the out of control federal government. Every state can be as libertarian, or as evangelical, as it wants. We’re a big tent. For lack of a better term I’ll call it the Federalist Coalition. It will not be led by neoconservatives, who are really warmed over Wilsonians, or American Imperialists. The rise of Trump is, in part, a repudiation of foreign entanglements. NATO is not really an alliance at all. It’s simply an American guarantee to West Europe against the Russians. It made sense when Russia was part of the Soviet Union. But that ended a quarter century ago. Today, the American people will not send their sons and daughters to die in a European war, and NATO is a dead letter. Adventurism in the Middle East is also no longer on the table. Lindsey Graham talks, but nobody listens. With North America self sufficient in oil and gas, we no longer have a vital national interest in that part of the world, other than guaranteeing Israeli security. The proper foreign policy for the Republican Party is the peaceful advancement of American interests around the world, in concert with our allies. We do not seek world hegemony. It was thrust upon us after world War II, but it was a temporary and unnatural position for a nation such as ours, with no natural enemies, and no desire to rule the world. Trump’s strident opposition to illegal immigration succeeds because both parties have lied to the American people about this issue for 30 years. Securing the border and adopting an immigration policy that puts the interests of the American people first is indispensable to the formation of an electoral majority. Political coalitions come and go. What must never change is our commitment to the Constitution and the rule of law. This must be the glue which binds the new Federalist coalition. 2016 may be a disastrous year for American conservatism. But if we listen to the voters, and heed their concerns, 2020 could be the year of conservative revival. If not, the party’s over.